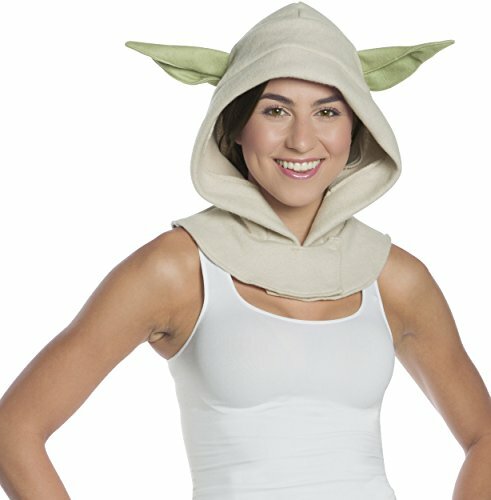 Yoda costume hood with ears. One size, designed to fit teens and adults. OFFICIALLY LICENSED Star Wars costume accessory, items shipped and sold by Amazon are guaranteed authentic. Create your own unique Star Wars costume look with components from Rubie’s. Rubie’s brings fun and fantasy to dress-up with the broadest selection of costumes and accessories, offering everything from full mascot suits to masks and wigs, from deluxe licensed costumes to simple starter pieces, from costume shoes to character make-up, and so much more. Family-owned, family-focused, and based in New York since 1950, Rubie’s promotes safety in dress-up so you can relax and have a great time while looking the part. Look to Rubie’s for every costume occasion and season: Halloween, Christmas, Mardi Gras, Easter, and all in-between.